Former PM blasts current government, says Bennett, Netanyahu leading Israel to Arab majority in undemocratic state. Former Prime Minister Ehud Barak slammed the current right-wing government led by Prime Minister Binyamin Netanyahu in a speech delivered Tuesday evening at the Eretz Yisrael Museum in Tel Aviv. "There are forces that distort space and time and the course of the entire Zionist project. The pursuit of a single Jewish-messianic state and a Muslim majority of citizens and subjects requires the destruction of the foundations and institutions of the Zionist-democratic state," Barak said. 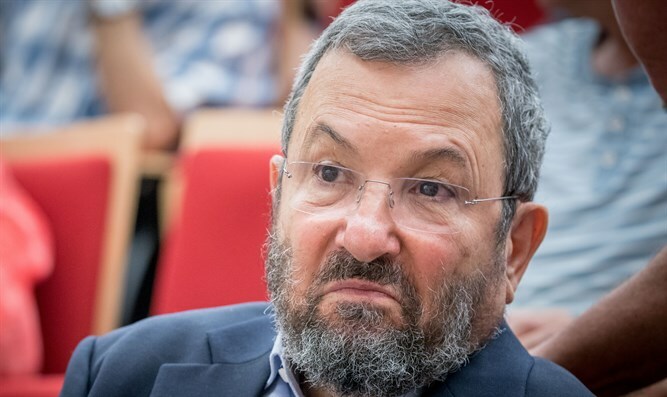 Barak attacked the leaders of the national camp, saying that they were preventing the "divorce" between Israel and the Palestinian Arabs, which would lead to one reality: "Israel's descent into a country with a Muslim majority, a violent internal conflict that is not Jewish, is not Zionist and is not democratic. This is a dramatic and dangerous change of direction in the entire Zionist project." "The achievement of this goal must be stopped by any means possible, because its realization is an existential threat to the Zionist project and to the existence of a Zionist-democratic Israel," Barak stressed. According to Barak, "a tiny handful is maneuvering a weak, pressured leader, behind whom is a populist party, on an extremely dangerous route that runs counter to the national interest and the positions of the majority of the public. An absolute majority of the Israeli public wants to ensure a Jewish majority and a Zionist-democratic character for Israel, and therefore, in the absence of an immediate possibility of an agreement, to divorce from the Palestinians. 'We are here and they are there,' while ensuring continued security control over the entire area for any period of time required." "I call upon the citizens of the state: It is time to wake up, the state for its power and achievements is yours, not ours, not the delusional group on the margins. "If, for the sake of clarity, we ignore the Likud radicals who are mainly addicted to their chances in the primaries, Netanyahu and the extremists who lead him are a group that represents a tiny part of the public, but manipulates the government as a tail wagging the dog. "These are Bennett and Shaked. Behind them are Yogev and Smotrich. Among them are Rabbis Sadan and Lowenstein, and behind them are the figures of Rabbi Lior, patron of the murderer Baruch Goldstein, whose rulings and teachings were suspected of being the inspiration for Rabin's murderer. Yes, my friends, this is the same rabbi who a few years ago won the title of “the commando that leads the nation of Israel” from Netanyahu. And who does not see Rabbi Ginzburg there, one of the fathers of the book 'Torat HaMelech,' which deals with the laws of killing non-Jews. "This is the man whose theory of revenge was suspected of being the source of the inspiration for the price tag thugs and the family of the Dawabsheh family in Duma. And, of course, Netanyahu also bothered to congratulate and praise, at about the same time, a video tape from Moscow, "Barak charged.